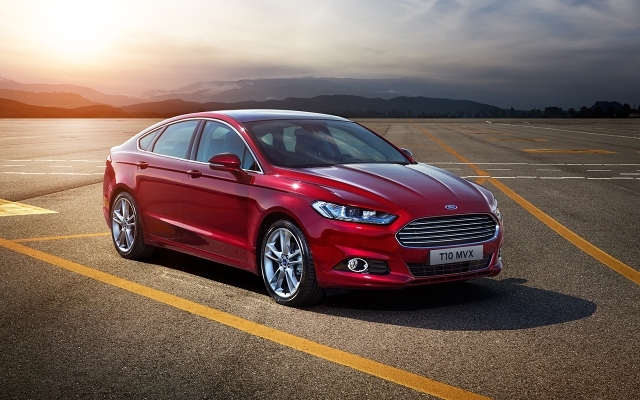 An all-new Ford Mondeo has been launched with petrol, diesel an even a hybrid version! Ford claims the new Mondeo, which is the first Ford model to use the new global CD-segment platform of theirs, delivers class-leading driving dynamics, innovative technology, greater refinement and craftsmanship and sophisticated design. It is available in the UK in the expected five-door and estate guises but also adds a four-door hybrid version. Petrol versions include a 1.5-litre and 2.0-litre EcoBoost and also the fuel-efficient 1.0-litre EcoBoost, while the diesel versions, of which some are available with ECOnetic technology, include 1.6-litre and 2.0-litre variants. Separate all-wheel drive variants join the line-up early next year. The new four-door Mondeo Hybrid combines a specially-developed 2.0-litre petrol engine with an electric motor and 1.4kWh lithium-ion battery to provide optimised fuel economy and low CO2 emissions (99g/km). A new pedestrian detection system is available, which processes information collected from a windshield-mounted camera, and radar located in the bumper, the car then warns the driver and applies the brakes to reduce the impact of a collision. Along with this, there is a new version of Active Park Assist which enables drivers to detect suitable parking spaces and then the vehicle will reverse into the space, hands-free. We now have rates for the Hatch, Estate and Hybrid models here on Compare Contract Hire from several leasing companies.